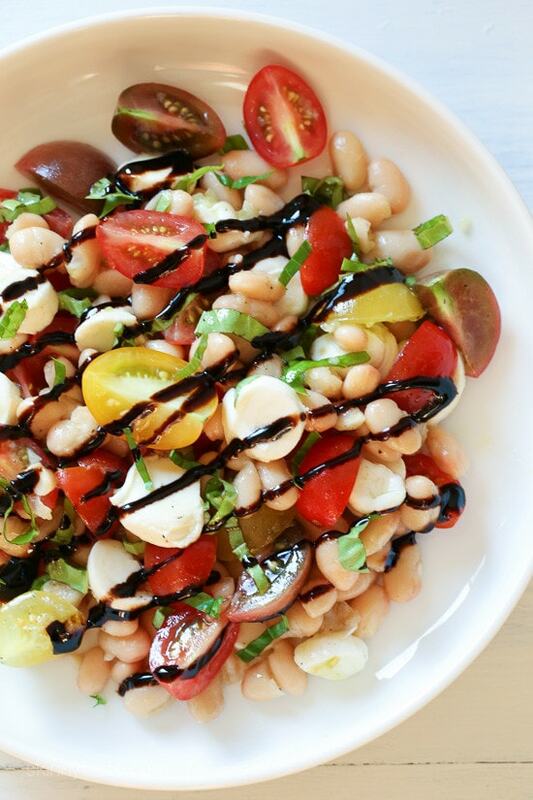 Nothing says summer like a Caprese salad, and this one is made with white beans for added protein and fiber. It’s EASY to make, and there’s no cooking required which is a bonus during these hot summer temperatures we’re having this week. 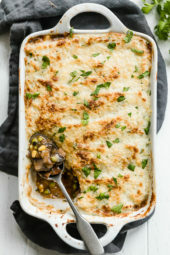 I served this as a side salad last night along with grilled fish and my husband really enjoyed it, but this would also be great as a main dish to pack for lunch if you increase the servings to 4 people. 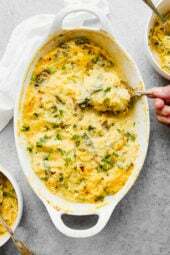 Perfect to make ahead and this can easily be halved. 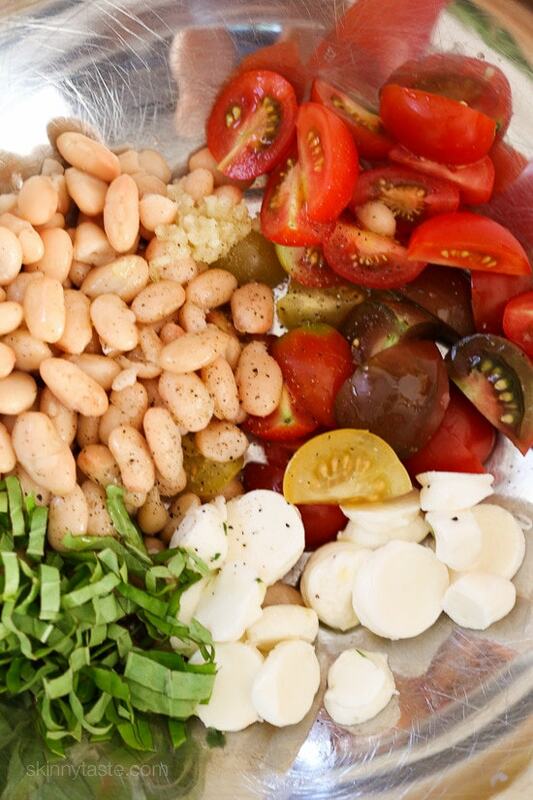 Combine beans, tomatoes, basil, mozzarella, garlic, salt and pepper. Drizzle with olive oil and finish with balsamic glaze. Pin This To Save The Recipe! I’m assuming this is safe to make this morning before breakfast and eat today at lunch? Took this to my work potluck. I received multiple positive comments and a request for the recipe. So that’s a thumbs up. Just made this and was very apprehensive at first because I don’t usually like beans. BUT, I actually took a 2nd portion because it was sooooo good!! I didn’t have any fresh basil so I substituted for 1 tsp dry basil and it was amazing. You’re making me like beans, which I never thought was possible! lol THANK YOU!! I made this tonight. It’s awesome! I had two servings since I had only eaten 4 points all day. So glad I saved up. YUM. Fabulous! I ate one serving, my husband devoured the rest. Served as side to roasted salmon. I made this yesterday as part of your seven day meal plan and it was DELICIOUS. I forgot to purchase the mozzarella so that was omitted, but I think that was perfectly fine! This salad was refreshing, filling and healthy. Thanks for the recipe! I didn’t have the glaze so just used regular balsamic vinegar. I feel like it was missing something to put it over the top, and that’s probably why! But very good and look forward to eating it this week! Made this as a side to the Crust-less Spinach And Feta Pie and it was amazing all around. So delicious! I love this salad! And I don’t even like tomatoes, but they really mix with all the flavors. I’m going to bring it to bbqs next summer, and camping, and everywhere! I adore caprese salad. Using the beans gives it more heft – I could eat this as a main course very easily. Also, the balsamic glaze is so much easier than making my own balsamic reduction. This salad is a win! PS…made the baked apple spice oatmeal last week from my Christmas gift cookbook and it is GOOD! This is a light, delicious summer dish. Brought this out as an afternoon snack when family was in town. They loved it! I just made this to go with my lunch. Instead of chips with me sandwich. Trying to eat cleaners. Thanks for the recipe. Gina.. love your recipes. I have all of your cookbooks and make meals on Saturdays for the week. They are easy, healthy, and everyone enjoys them. Wishing your more success. I frequently post your link on the weight watchers site. A-Mazinbg! So quick and easy to make and absolutely delicious! How would it be if you roasted the tomatoes? How long would this keep ? Sometimes I just use good balsamic vinegar (no glaze) and I have added avocado and fish beets! Delicious! Hi- what are fish beets? I googled them with no luck. You should be able to find it at your local grocery store. Absolutely delicious, but I'm afraid what is 4-6 servings to you was 2 for me! This one will be a challenge for me, portion wise. I am having this for lunch right now. No fresh mozzarella in the house, but I put it over arugula, and it is delightful! What is the shelf life if you make it ahead for lunches? I made this last night as a side dish for dinner. I ended up eating so much I couldn't eat anything I cooked. Was amazing. Going to use the rest of the mozzarella/basil I have leftover to make another batch today. I must have shared this recipe with 15 people today. This salad was delicious and so fresh tasting with the basil. I will definitely make it again! Had this for lunch today and it was amazing. If I hadn't already portioned out my serving I probably could have eaten the whole thing! I couldn't find the glaze, so I just used balsamic vinegar, and even though it looks like a small serving it has been pretty filling. Definitely making this one of my go-to summer lunches! Thought the little white circles were hearts of palm. Used that instead of the mozzarella. So good. Great recipe! Thanks! I made this today. Rather than chopping the basil, I tore it into big pieces, and used about three more big basil leaves. It was very good, but it really needs more fresh mozzarella. Caprese salad usually has a ratio of mozzarella to tomatoes of about half and half. I realize that would make this too rich to qualify as weight watchers fare; I consider it a nice side. I cooked the beans from scratch to be able to control the degree of doneness. Having them a little less done than canned beans adds the tiniest bit of crunch to an otherwise soft dish. To answer another poster, mixing the balsamic through will discolor the chunks of mozzarella. I think that is why it's zig-zagged over the top for presentation. I like it better without the balsamic. Authentic caprese has only olive oil. I think the balsamic overpowers the wonderful flavors of homegrown tomatoes, fresh mozzarella, and fresh basil. Thanks for another great idea, Gina! Maybe a silly question – but the notes say " if you increase the servings to 4 people.". But the serving size is 6 in the recipe. Shouldn't that be DECREASE the servings to 4 people for a main dish? I'm sorry I didn't have this recipe for my family reunion a couple of weeks ago. But I will make it for myself anyway!!! I made this to take to work this week. It tastes soooo good! I love caprese salad! Great idea! I made this salad for lunch. It was triple delicious! Thanks so much for introducing me to Balsamic Glaze. The brand I found was Monari Federzoni and it was delicious! I've been looking for a health dish to take to my family reunion next month. This will be something I can eat, and enjoy, in place of all the junk food that will be there. Thanks so much. Where would I get fresh mozzarella from? What is caprese? Caprese is tomatoes, mozzarella and balsamic. Fresh mozzarella is found in Italian delis, and often the olive bars in many supermarkets. Also if you live near a Trader Joes, they sell the small balls in a container of water. We've always know caprese as tomatoes, mozzarella and basil. Having it for lunch right now. It seems like such a small amount for a serving. Perhaps because it is so delicious I want to eat all of it. Though the serving is satisfying for sure. Another great summer salad recipe. The glaze appears mainly to be for decoration purposes; I'm substituting balsamic vinegar which I have in abundance. I mentioned if you have this for lunch, it serves four. So a serving woul be about 1 very large cup. But sure, eat more if you wish, it's all good! Can I use chick peas? Going to make this tonight! 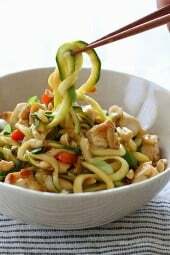 Ive been making something very similar to this but using YOUR skinnytaste pesto recipe! Its so good in this. ! I love your pesto! I know the fresh mozzarella comes packed in water but I wasn't sure if all the readers know that it isn't anything like the pizza style mozzarella. Caprese is usually made with mozzarella, but you can try a different cheese if you like. I'm going to try it with Feta Cheese. Mozzarella and I don't get along. This type of salad is also delicious – & more substantial as a main meal – if one adds a can of drained, good-quality, olive-oil-packed tuna. This looks great! 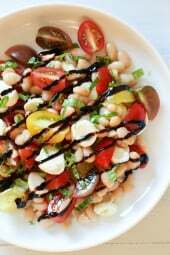 I love beans and caprese so it's right up my street – I'm sure the beans add a lovely creaminess! Looks very good and good for you. For the guys could you add a few other kids of beans, or chic peas? How about a few olives both green and black . I can think of many other ways to embellish it but this basic looks very tempting. Of course but that changes the points and calories. Looks delicious! I like how the white beans make the salad a more substantial meal. Jennifer Moeller, you can make your own glaze by bringing regular balsamic vinegar to a boil, then lower heat and simmer it till reduced by about half, till it has a syrup consistency. Iit's just easier to buy it & have it all ready on hand. do you have to add the white beans?? Can you use GOYA white beans? You can use any white beans. I have used balsamic vintager mixed with brown sugar to taste. Some like it sweeter and some not. It's really awesome. I've added avacados, grilled chicken, sautéed green peppers and onions too. So, so good. Is balsamic glaze something you can make on your own from the vinegar, or do you buy it pre-made? Sorry I should add a photo. I use Delallos, but tI've seen other brands. If not you can just use regular balsamic, although it won't look as pretty. Buy it in your local supermarket. You can make it yourself by reducing- simmering balsamic vinegar on low- until it coats the back of a spoon. Don't use regular balsamic in its place, as it is not the same. Trader Joe's has a reasonably priced Balsamic Glaze that I love. I use it on watermelon, feta, cucumber and mint (or basil) salad. You could try mixing a little bit of cornstarch with a few tablespoons of water. Over medium heat warm up some balsamic vinegar add the cornstarch and stir until it thickens. I think it’s better to cook over low heat to thicken. Corn starch will change the taste. I am a big balsamic glaze fan!. I love it on avocado. I also use it in my tuna salad. No more mayo for me. It is a staple in my pantry now. 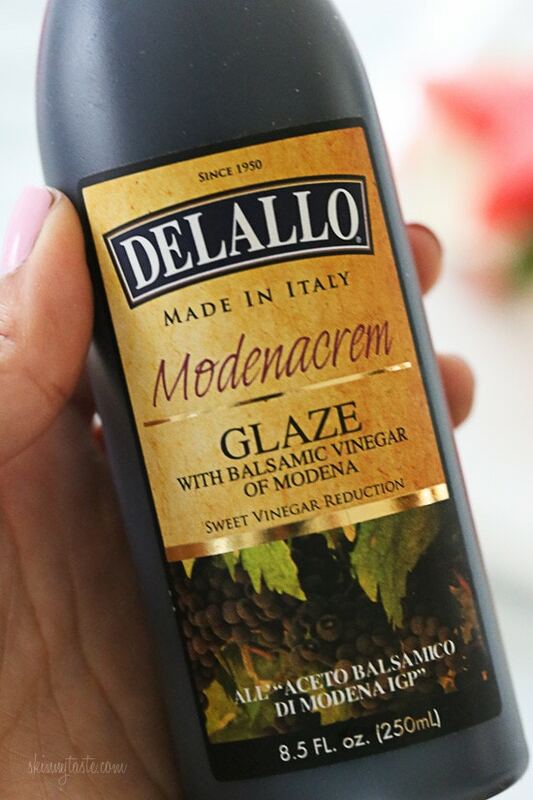 You can buy regular balsamic, but in order to make a glaze, you reduce it so it becomes thicker and actually sticks vs. making everything watery.